Junk cars for cash in Ohio with free pickup. We provide the fastest cash for junk car service in Ohio. Greetings Buckeyes! Do you have an old junk car on your property that you’ve been trying to figure out how to sell? Maybe your car isn’t junk, but you need to sell it quickly because you’re moving or need a down payment for a new one. Whatever the reason, The Clunker Junker pays more cash for cars in Ohio than any other junk car buyer in the state. We’ve earned that distinction by paying top dollar for junk cars and providing the very best customer service the industry has ever seen. We buy cars, trucks, vans, SUVs and more in Ohio. But here’s the best part: Every offer we make includes free junk car removal. That’s right, you’ll never pay a dime to have the car picked up and towed away. From football (Go Ohio State!) to rock and roll, Ohioans are known for their passion. At The Clunker Junker, we are passionate about not only paying cash for junk cars in Ohio, but making sure the experience is fast and smooth. Whether you’re in or near Columbus, Cincinnati, or Cleveland, we strive to make sure we pay you top dollar for your junk car. City life not for you? We also buy junk cars in many of the more rural areas of Ohio where we provide the same free pickup services. If you’ve ever tried to sell your junk car in Ohio by yourself on a classifieds website, you know just how much of a hassle it can be. Between the dozens of questions from potential buyers (that are answered in the ad, by the way!) to unreliable people who won’t show up when they say they will, your time is worth more than it’s worth to deal with these headaches. The Clunker Junker will never try and take you for a ride (Unless you want to hit up Cedar Point with us!) like an Ohio auto salvage yard would either. When you see how easy it is to sell your car to us, you’ll be saying “Holy Toledo, that was easy!”. Whether you’re driving around new car or an old beater, we'll need to gather some details about both you and your vehicle to sell your junk car in Ohio. We’re going to need to know the exact year, make, and model of the vehicle, so that we can give you a rough idea of what we can offer you before taking it to an auto salvage yard. But rest assured: We’ll still pay top dollar for junk cars in Ohio, no matter their condition. In most cases our website will generate an instant offer once all the required information has been entered. If you choose to accept the offer, we will connect you with our fully vetted Ohio junk car buyers who will schedule a time for pickup. Many of the cars we buy are picked up within three business days or less, and some even on the same day. When our Ohio junk car removal specialist arrives, they'll do a quick look over the vehicle to make sure the condition was accurate. Then they will pay you cash for check for your junk car and haul the vehicle away completely free. How much is a junk car worth in Ohio? Has your car not moved in years? Odds are it likely belongs in our first category automotive junkers. These cars will be recycled or sold to Ohio junk car buyers and junk yards for raw materials. The size and weight of these vehicles will determine just how much we can offer you. However, you can expect around $50 to $200 for your ride before we tow it off to an auto salvage yard. Think your car still has some life to it? Then, it might what be what we call an “in-betweener.” Because of these cars sit in a certain gray area, exact prices are a bit harder for us to put down. Nevertheless, junking these cars will yield more cash than those in the first group. 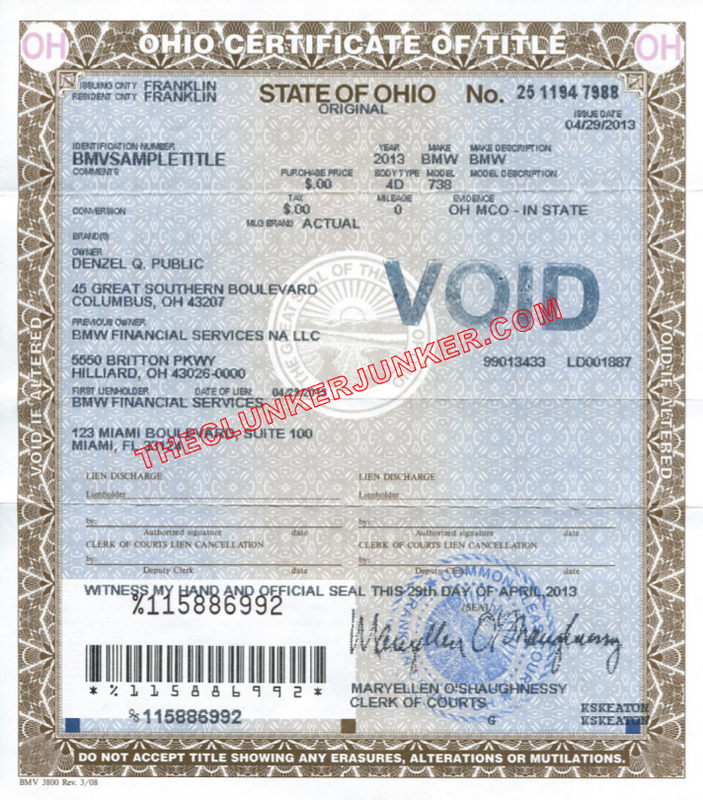 Required: The state of Ohio requires that all titles are signed in front of a notary public! We have put together a simple guide and example for how to sign your Ohio title when you are selling your vehicle. If there are multiple owners listed on the title, they must all sign the title unless the names are separated with "OR". Ready to sign your Ohio title? Flip it over to the back and find the section at the top that says "Assignment of ownership". This is where you'll need to sign, print, and have the notary stamp the title. Sign the back of the title where indicated by "Transferor's/Seller's signature". 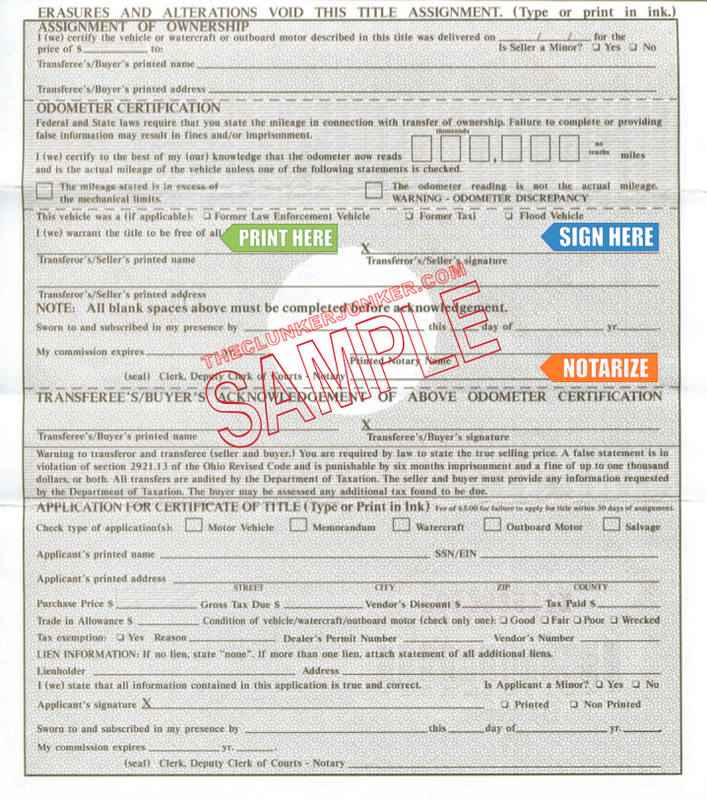 Print (don't sign) your name on the back of the title where it reads "Transferor's/Seller's printed name"
Fill out the Ohio Application for Certificate of Title of a Motor Vehicle. Bring your completed application to your local Ohio BMV office. Please note that there may be a waiting period before a duplicate title can be issued and the cost is $15.00. (Paid to the OH bureau of motor vehicles). Getting rid of an abandoned vehicle in Ohio can be a difficult process. Unfortunately, you cannot just sell any junk car that ends up on your property if you do not own it. You'll need to follow the Ohio abandoned vehicle removal procedures. We have given a general overview of what that entails below. To have a vehicle removed from your private property, you must first contact your local law enforcement office to have them dispatch a salvage yard to tow the vehicle. If the salvage yard must attempt to contact the last registered owner by submitting an BMV Record Request. 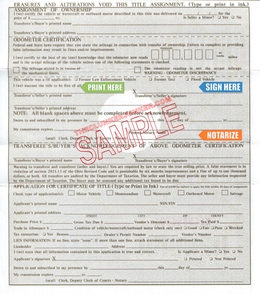 A notice must be sent through certified mail. It it returns undeliverable, an advertisement has been made in a newspaper of common circulation in the county which the vehicle was last registered and/or found before the salvage may submit the Abandoned Motor Vehicle Affidavit to begin applying for the title to the vehicle. Can you buy cars and trucks with no title in Ohio? Yes, in some cases, but not all. The vehicle must be of a certain age, and not all of our buyers are willing to buy vehicles without title. The buyers who do make offers will require you to prove ownership with a photo ID and registration. Your offer amount will also be much less if you don’t have the title. 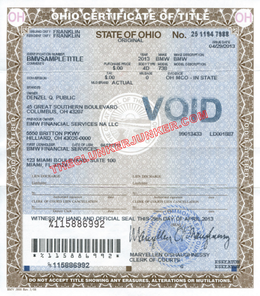 Ohio often changes their title documents from year to year. If you have questions about your specific title, please contact your Ohio BMV. Yes, unless you are transferring the plates to a new vehicle. You can return the plates to your local license agency. You may need to notify your local BMV that you have sold the vehicle. You can contact them with any additional questions or concerns about the transfer of your title. Towing away junk cars and paying people the cash they deserve for their car is what we do day in and day out. Ready to rid yourself of your old ride? Reach out to The Clunker Junker today, and trade your old car for top dollar cash! "The vehicle runs and is drivable, but it's not in perfect running condition. The exterior is in fairly good condition with the exception of some scratches on the doors. The interior is in fairly good condition with the exception of the front leather seat being torn. It just has small mechanical problems (power steering wheel). The A/C blows warm sometimes as well. " "The vehicle drives right now, but the engine is knocking badly. We just put a brand-new battery in it and would like to take it out and try to junk it for some cash. Can I get a cash offer with and without the battery? Thanks!" "The vehicle has a warped/cracked head gasket which is going to lead to the replacement of the water pump, timing belt, radiator, etc. It also needs intake fan wiring." "The vehicle needs a transmission. Third gear is gone. It has a few scratches, and the front bumper is a little loose on the passenger side. The passenger-side mirror is taped but is working. It's all electric, it has heated seats, and it has an electric sunroof." "The vehicle has a new alternator and belt, igniter, radiator hoses, battery, four tires and gas tank. It has a second rebuilt motor and a first rebuilt transmission. A thief took the rear view mirror. The driver seat is worn. All of the power windows and locks work. It missed smog by one point, and the EGR valve was replaced a few years back. The car hasn't been driven every day, as it's more of a back up car which is why it didn't pass. I'm the second owner, and my parents were the first owners. I have all of the paperwork since day one, and all DMV registration is paid. " "There is a mechanical failure in the transmission that prevents the car from shifting past second gear, and there's a dent close to the rear door on the driver side. " The Clunker Junker is one of the top junk car buyers in the state of Ohio. To date we have made instant offers on over 40 thousand vehicles across the state, totaling over $11 Million offered! We were not able to purchase many vehicles without a valid title. We also buy cars on a wide spectrum of conditions and 58% of the vehicles we've made offers on in Ohio do not start or drive. Many also have moderate to severe body damage. Columbus in Muscogee County was our top producer, followed by Dayton.